Vietnamese, like many other East Asians, have always been a bit wary of talking about death and dying. However, the superstition does not extend to visiting cemeteries and cleaning graves at appropriate times of the year. Seventy-five-year-old Le Quang Dao from Ha Noi usually visits his wife's grave at Lac Hong Vien Cemetery in northern Hoa Binh Province early during the tomb sweeping festival (thanh minh) in the third lunar month. He said that the festival lets his children and grandchildren know where their ancestors rested. They usually clean the grave sites and, like millions of others, offer incense and wine to ancestors. This year, Dao looked at a grave site next to his wife's. He bought it for himself to rest at the end of his days. "Some cemeteries in Ha Noi are going to close as they no longer have land for new graves," Dao said. "So, I bought some slots for my family and built a grave for myself." 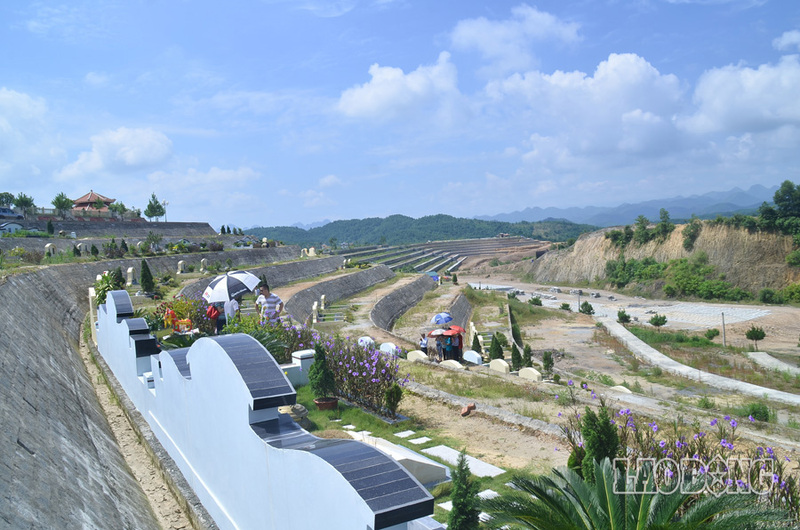 Another man visiting the same cemetery for the tomb sweeping festival, Nguyen Thanh Son from Ha Noi's Ba Dinh District, said his family had eight graves for family members. "My father's remains are in the grave at the centre. Surrounding graves will be for me and other family members," he said. And then there is Nguyen Thi Man, 72, who said that she bought a space for herself six years ago and that she visited her "future house" weekly. A US$18 million housing project in Quang Minh Commune in Ha Noi's Me Linh District started more than 10 years ago with plans to provide villas and luxury apartments for about 3,000 people. The project was also supposed to include public facilities, such as schools and roads, but they were never built. The slowdown was caused by Viet Nam's gloomy real estate market, which lasted for several years, affecting the construction of hundreds of apartments and villas. In an attempt to recoup some of its investment, which was rapidly turning into a loss, project backers Viet Nam Construction Joint Stock Co No 2, let out uncompleted villas to anyone who wanted space for production workshops. A worker revealed that his company paid VND 7 million ($350) rental a month to use an uncompleted building as a workshop. He said that they rarely saw anyone from the investing company at the site. Just as well. It's about time some-one took note of the fact that other entrepreneurs are from the rural sector. This would explain why some villas are being used to raise pigs! There is now talk about a third bridge being built beside the Long Bien and Chuong Duong bridges over the Red River in central Ha Noi. The sooner the better! When that sun-blocking new building is built at the entrance to the Long Bien Bridge on the other side, there will be a huge need for extra roadway for motorbikes - and those ever-increasing road blockers, the modern SUVs. In the meantime, many would be happy if the authorities would simply stop motorbikes from travelling both ways on the single-lane Long Bien bridge. There is nothing more disconcerting than to find a laden motorbike rushing at you from the wrong direction with its horn blaring - especially if there is no place to move! In 2013, the publishers of a Sri Lankan newspaper named Mawbima mixed citronella essence, a natural mosquito repellant, with printer's ink to produce their paper. The idea was to educate middle and lower-class readers on the seriousness of a dengue-fever epidemic borne by mosquitoes. In the social media, the move earned thousands of "likes" as well as high profile comments, including one from Bill Gates. Mawbima's sales rose by 30 per cent and readership by 300,000 (the paper was passed from hand to hand), exceeding the paper's wildest expectations. While it seems a great idea, it would probably not work in Viet Nam, which also has a dengue-fever problem. And old newspapers here are often used to wrap sticky rice – a favourite breakfast snack for many Vietnamese.